I can usually ignore it. Sometimes even laugh about it. Most of the time I just roll my eyes and go on about my awesome life. But not this time. Not today. I’ve had it. Moving away from Kentucky 14 years ago was great in the sense that I could now actually enjoy college basketball without what has become #BBN ruining it. It was awesome. I could go to sports bars and not a soul wearing blue, especially the Gillespie years. But then came Cal and his brash roadshow that took a smoldering car tire burnt out from donuts in a Waffle House parking lot and ignited it into a three alarm BIG-O warehouse tire fire. A hot, dense, black, repulsive stench of a fire that seems impossible to put out. Still, the obnoxious posts from my family and friends; the constant labeling of other, let’s just say “basketball” players as thugs; and the now bandwagon blue that shows up more than before around my formerly new, clean city didn’t bother me. Until now. Why? 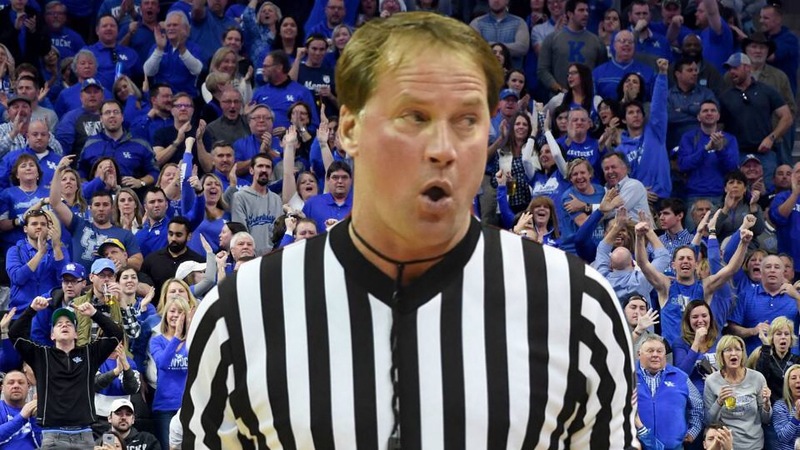 Because I LOVE college basketball; I used to BE a basketball official for the CSAA in Louisville; and I went to law school long enough to know the behavior of what is slowly becoming a terrorist cult called #BBN has gone too far. Sure, tweeting at players and recruits and whomever else gets into their craw on a voluntary social media platform is one thing. But going after the official of a game played by 18-22 year olds via defamation, libel, slander and criminal mischief is quite another. It’s actually illegal and actionable. According to my Black’s Law Dictionary, the definition of Libel is “a defamatory statement expressed in a fixed medium, esp. writing but also a picture, sign, or electronic broadcast. Libel is classified as a crime and a tort but no longer prosecuted as a crime.” The first amendment protects libelous claims, however, Defamation is not. Defamation is defined as “The act of harming the reputation of another by making a false statement to a third person.” If an alleged statement is made, the “plaintiff” is required to prove it false and of the “defendants” fault. (While I can certainly cite Blacks Law Dictionary, Seventh Edition here, I’m not.) Defamation is a civil action, with penalties of a monetary nature. Certainly all the elements of recent actions by #BBN are met by the facebook posts alone on Mr. Jim Higgins business page. Perhaps a class action lawsuit could help beat these senseless acts back, however, the more serious and criminal matters are the direct threats to Mr. Higgins and his family via those same posts and calls made to his personal phone as reported by ESPN. I refer to the Nebraska State Code, as Mr. Higgins would likely have venue, and sure enough chapter 28-519 defines Criminal Mischief if a person “Intentionally or maliciously causes another to suffer pecuniary (monetary) loss by deception or threat.” It goes even further, stating “Criminal mischief is a Class IV felony if the actor intentionally or maliciously causes pecuniary loss of five thousand dollars or more, or a substantial interruption or impairment of public communication, transportation, supply of water, gas, or power, or other public service.” Thats right, its a potential FELONY, and that’s not even getting into the personal accusations of child molestation, racketeering, and other claims against this man. This is just what should be a slam dunk with the courts. So, short of starting a GoFundMe legal defense fund for this man, I am writing this plea to stop because it is A. Criminal, B. actionable, and C. detrimental to the game I love. So many responses, even by verified #BBN accounts, are actually trying to justify these actions. That means there’s no remorse. That also means, in the minds of some “fans” if no action is taken or desired result is achieved, there must be further retribution. Whats next, #BBN? Well since the current actions are already criminal, it can only be physical harm or destruction to property. Think about that for a second “UK fans”. You’re one action removed from committing violence. Once that happens, the “tire fire” burns down the town. For the sake of college basketball, civility and sanity, either get a life and stop committing criminal behavior or trade your blue and white gear for the orange “thug” jumpsuits you accuse others of needing.